Complete your living room look with one of our high-quality footstools. Our footrests are available in a range of styles and colours. 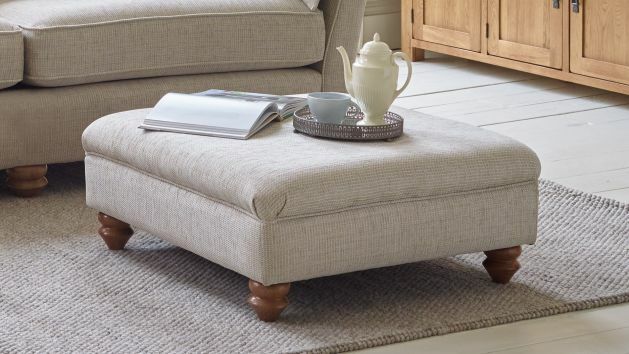 Kick up tired feet on one of our stylish footstools, ideal for adding the perfect finishing touch to your living room. All our footstools have been designed to coordinate with our sofa ranges, so you can easily create a harmonious look. Choose from a wide selection of 100% real leather styles, as well as quality upholstery fabrics in stunning colours and patterns. Plush padded tops provide a supremely comfortable resting place for tired legs while you’re relaxing in front of the TV or enjoying a good book. We also offer storage footstools, ideal for adding extra storage in your living room and tucking away living room bits and bobs. And don’t think you have to limit a footstool to the living room – it could just as easily work as a quick resting spot in a hallway, or a place for kids to sit to put their shoes on. In bedrooms, footstools are a stylish alternative to blanket boxes at the end of the bed, too. Browse our high-quality footstools and remember that we will deliver your purchase free to the room of your choice as standard, so you don’t have to worry about carrying or transporting it. Our team will take care of all of it. All you need to think about is what your favourite lounging position will be.